I have got to say it's really easy to use and very fast. It's the full file transfer and backup solution I have been looking for but never found. Everything else is really inferior. A few clicks and your files are transferred between the PC and Z88 in a whiz. Best tool I ever brought for the Z88. I really do wonder how I lived without! See Z88 Wiki Quick Internet Links for further information. Upgrade from PC Link II here. It works with a USB to Serial Converter – so even if your PC does not have a serial port, you just need one of those. or is available here at extra cost *. 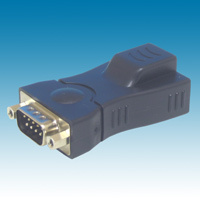 Note: The latest versions are now Eazylink 5.2.3 - 06 and OZ 4.7.
or a Z88 to 9 way connector. We no longer stock these adapters as they are available on the web. Click here to search on Google. For example Amazon are advertising them for only �2.99 inc VAT and postage (25/08/2011). 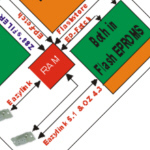 Eazylink needs a USB to full handshake UART Device. If you get a USB to basic UART Device, it will not work. Getting the right adapter and how do you find out? Now that Windows 7 and 64 bit computers are around, please make sure that you purchase a quality product, one that supports a full handshake UART and has the correct drivers for your Operating System. First, you need to find out which chip set the adapter is using. Let's say it uses an FTDI FT230X. Look this up on Google and then on their website - http://www.ftdichip.com/FT-X.htm we find that this is a USB to basic UART. This is not what you need. If on the other hand it was a FT231X - a USB to full handshake UART, this device would be suitable. Here is the correspondance with Bob Calvert (19/12/2004) about this issue. The only potential problem is how to connect the Z88 to the laptop - there doesn't appear to be a serial connector in sight!, but there are lots of USB ports. I have checked with several shops here and it is possible to get a serial to USB adaptor. So...could I ask if you have come across this problem already? Will a serial to USB adaptor work? I'm inclined to try it and see but would appreciate your advice. Reply - USB Serial Adapter should work, but I have not received any first-hand reports. As long as Windows thinks it is a serial port you should be OK. You will have to try it and see. Let me know the result. Just a quick email to let you know the Z88 to PC transfer works via the serial to USB adaptor. The trick is to ensure you know which coms port the PC decides to allocate! We are very pleased we can continue to use our Z88! Thanks for your help. If you already have PC Link II consisting of the following items you can purchase the Eazylink upgrade to save duplicating the hardware required. Use any free serial COM port that Windows can see, unlike PC Link which can only use COM.1. Eazylink sets the time and date on the Z88 to the same as the PC. Eazylink will stop sending files to and from the Z88 when the battery on the Z88 is low. 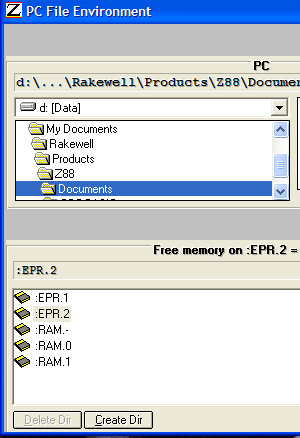 EazyLink also contains a file transfer log facility which remembers every file transfered. and the Z88 file date stamp. This report can then be printed and used as a hardcopy record of what files have been backed up for future reference. with its own file translation programs. so you can keep your page layouts. Even if you want to use Desk-Top Publishing programs, layouts can still be retained by importing a WordStar file into the program you use. The EazyLink ROM emulates 100% and performs 25% faster than the original PC Link ROM. Further, with the PC-LINK II emulation, you get transparent linefeed conversion and ISO LATIN I/DOS codepage translation during transfer! In other words, you're still able to run the old PC-LINK II DOS program and PC PipeDream when using the EazyLink ROM in the Z88. Existing users of PC Link II can upgrade to EazyLink cost effectively. when files are transferred to the Z88. All you need is to upgrade your MAC Link ROM to EazyLink V5.0.4. Recently I had to reinstall Windows (and of course everything else) ... and now EazyLink will install but won't run, complaining that it has an "incorrect" version of MSJet35.dll. I have however now solved my problem, by downloading Microsoft's Jet Service Pack 3 from their website, which upgraded my copy of MSJet35 to version 3.51.3328.0 - and for some reason EazyLink is now happy.